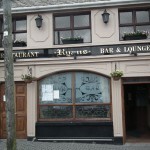 Located in the center of Scariff opposite the landmark site of the market house. The owners Carol and Michael and all their staff welcome you all to this spacious, warm, relaxing and welcoming atmosphere. Ryans Bar hosts a wide range of entertainment throughout the week. From card games to a game of bingo you’ll find it all at Ryans. On weekends the entertainment steps up a gear, music on Fri &Sat nites with bands playing a wide range of music to suit all tastes. If you feel like strutting your moves on the dance floor to the sound of all the latest hits join us for our continental disco each and every Saturday nite. If its sports you are after, all major sporting events can be shown on the big screen.